Chemistry professors Drs. 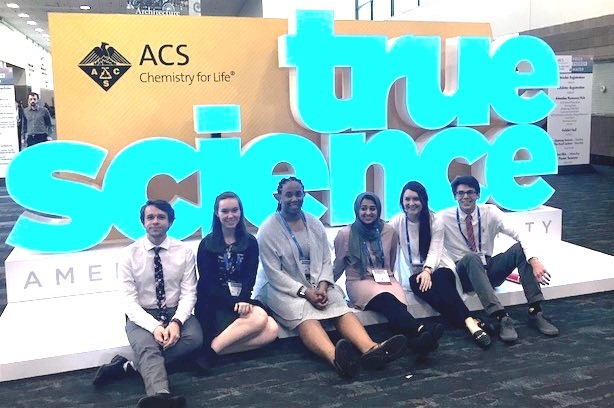 Alison Parker, Rachel Rigsby and Justin Stace, along with Belmont Chemistry majors Avery Daniels, Tyra Avery, Hannah Peterson, Amber Ansari, Christopher Hanson and Mary Barber attended the 255th American Chemical Society (ACS) 2018 National Meeting in New Orleans, Louisiana March 18-22, 2018. ACS organizes two national meetings and expositions each year, and each one attracts an estimated 11,000 to 13,000 chemists, chemical engineers, academicians, graduate and undergraduate students and other related professionals. Students and faculty enjoyed a graduate school fair, undergraduate research poster sessions and graduate and professional research presentations at the meeting.